Only residents of Baycrest have access to this site. The one exception is this Home page. The Little Free Library is a “take a book, return a book” free library exchange. The library at Baycrest was established in the fall of 2015. This library is open to EVERYONE and is part of a world-wide network of book sharing. It will no doubt be used most often by Baycrest residents and guests, but anyone can visit our library and borrow a book. Anyone may take a book to read, or donate a book to share. Feel free to browse the books and take anything you want to read. If you want to donate a book, simply put it in the library. You do not have to donate a book in order to take a book. Some donate many. Others will just borrow and read. The library operates on the honor system. In order to keep the library full of good choices for our neighborhood, we rely on donations of good, used books. 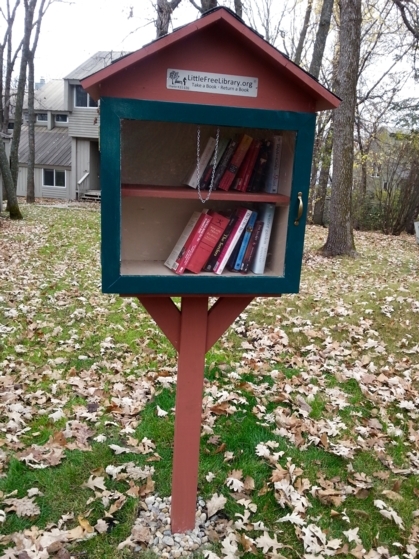 Our Little Free Library is located on Baycrest Road, across from the upper mailboxes and next to the StarTribune newspaper stand. Our Baycrest Little Free Library is chartered with the international organization, Little Free Libraries, LTD, a registered non-profit that supports neighborhood libraries around the world. To find our library on the worldwide map, go to littlefreelibray.org, click on the”Map” link, type in the Glenwood zip code. People familiar with the Little Free Library system will sometimes look for library sites as they are travelling and drive through a community with the purpose of finding the library to borrow or donate a book!